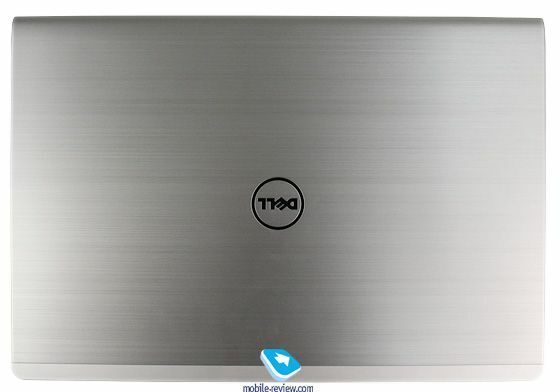 Dell Inspiron 5748 is the largest in size in the line of laptops Dell Inspiron 5000 Series This laptop is designed to be a complete replacement for a home computer, and the mobility of the device is quite arbitrary. And the main problem is not so much the weight of 3 kg as its size: the size of the lid up 41,4×28,5 cm. And it’s not just in large screen sizes, but in the vast fields around it. The compactness of the creation model is not thought. Also catches the eye unusual ratio of the thickness of the cover and housing – at a fraction cover not less than 1/3 of the total thickness of the notebook. If we talk about the technical component, the model turned in any form is not very productive system. 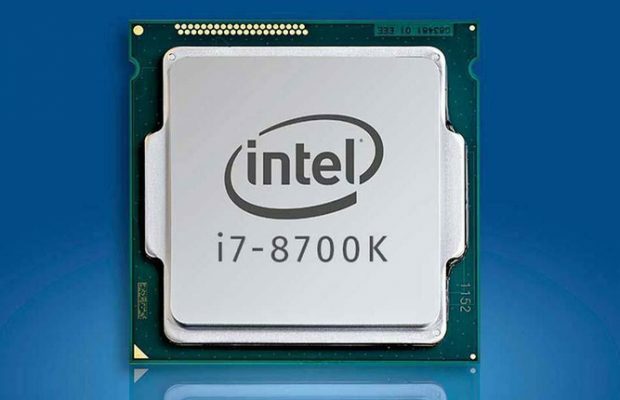 There are variants of processors Intel Pentium 3558U, Core i3 4030U, Core i5 4210U, Core i7 4510U, but as you can see, in any case, this energy-efficient option, and the maximum clock frequency is less than 2 GHz. In addition, despite the large size, the laptop was only one memory slot, and its volume can not be more than 8 GB. The same situation with discrete graphics: NVIDIA GeForce 820M or 840M – not the most productive solutions on the market. One would assume that this is done for longer battery life, but it is also small, as in the kit can be battery or a 41 Wh, or 65 Wh. Therefore it is necessary to recognize that the model is made to unify with the more compact solution line and the general economy in all possible ways. As I said, the design of the notebook looks a bit unusual – it seems disproportionately thick cover. What is the reason, I can not say, but it looks strange. 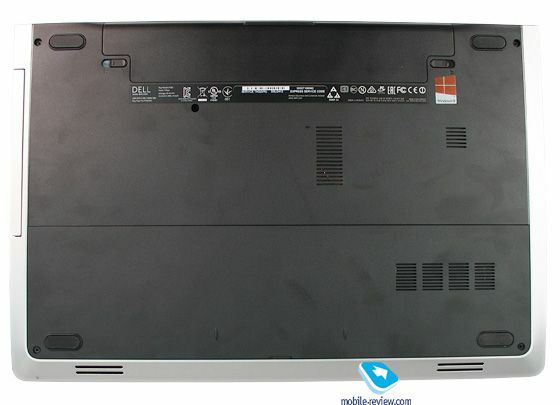 The rest is a typical model of the lower edge of the middle price range with a design developed for the entire renovation Notebook Dell Inspiron 5000 autumn 2014. Difference can be called that of all models of the most awkward having a maximum continuity with the traditional design of laptops, common to all models of zero years. Housing cover covered with aluminum panel. There are also a number of other metal parts, which allows the manufacturer to talk about aluminum housing. 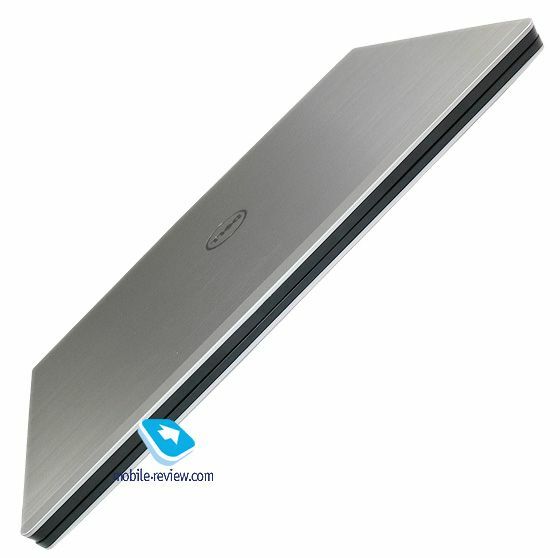 In fact, this is a traditional combination of thin aluminum sheets with an abundance of thick and hard plastic. It looks better than felt in the hands, but this situation is typical for all similar laptops, there is no progress or regress. The assembly is ambivalent feeling. On the one hand, when the laptop is on the table, the impression is quite pleasant – the gap between the parts are uniform, we can not say that all the close-fitting, but some significant problems there. The situation changes radically when you take a laptop in hand – literally each joint can grind. In this case, there is no tangible backlash, and the sound is. Body materials can generally be called successful. Inside, everything is made of matte black plastic, which is surprisingly good at hiding fingerprints. Even after prolonged use laptop does not become soiled, which is a rarity. The lower part of the body is edging out the same dull, almost velvety plastic, but here it is colored gray. In this panel are chamfered and slotted for the speakers in parallel strips, which hides a large metal mesh. The bottom panel is also plastic. Here on the material already saved frankly – hard plastic and thin, pressed at the slightest bend, and if for him to tap, it will start to rattle. Behaves similarly to the aluminum panel cover. In general, do not knock on this laptop, nothing good will come of it. It is interesting that despite the huge size 17-inch laptop, the battery fit into his body failed. Battery increased capacity need special accommodation with the release of the protrusion above the keyboard. This lip is not part of the battery can be expected, but merely covers it. Because of this, under the screen appeared rounded recess. A distinctive feature of the 5000 series in 2014 was the presence of a special projection screen fringing. It prevents the complete closure lid to the body and thus allows to avoid contact with the screen keyboard. This projection is made of the same black matte plastic that all the fields around the screen, and in everyday use is practically imperceptible. Useful and practical solution. Above the screen is traditionally camera with microphone. Next to the camera – LED informing the camera or giving extra light in a lack of light. Distance from the LED and microphone to the camera unequal, microphone strongly shifted to the left. It looks asymmetrical, but familiar to many other solutions company. Under the screen in the middle, above the recess for the battery, put your logo done by a gray paint. Hinges very massive and very tight. Again, in the Dell rely on long-term operation, but because of this it turns out that open the laptop with one hand is not possible. In our office with this problem no one right – if you just pull something off the laptop from the table, but the lid is in the same position. In general, the model was very ambiguous, so if you are going to buy this laptop, it is better to see it live, it makes sense not only for those who are important appearance of the device. Many creaking structure may seem too flimsy, though for the communication with the laptop I have not noticed any serious problems (with the exception of the touchpad, which will be discussed below). As already mentioned, the laptop weighs about 3 kg in the minimum configuration. To the maximum – more than 3.3 kg. Dimensions cover up 414,3×285,7 mm and the thickness varies between 28.4 mm for the version with the conventional to 29.6 mm with a touch screen. Yes, even in strongly increased thickness of the cover touch screen to enter the failed, it took even more to increase it. Neither weight nor size in this case can not be attributed to the pluses, minuses to no. It is unlikely that someone would use such a model, regularly carrying it from place to place. The keyboard, of course, complete with numpadom. The buttons are large, made of solid black matte plastic. The distance between them is also relatively large. The keyboard is designed for long-term use with the possibility of an active set of texts, which is very useful for the model, which replaces the stationary computer at home. Key travel large when fully pressed they go a bit a couple of millimeters, flush into the body, and in the normal position is as towering over him. The touchpad is large, sensitive, but its design is extremely bad – the buttons are made integral with a touch panel, in which only the top of the mount (or the feeling is), because of what it is at any time you press not only vibrate, but also unpleasant rattling. But certainly no unexpected clicks – alerts sound, which is not desirable. Location of controls, indicators, and connectors traditional. The power button is located in the upper right corner. Its size is not very large, but there are no problems with the touch, even though it requires considerable effort and goes deep into the body. As well as many other models of Dell, it has no built-in LED turn on, and what seems to be such – it’s just vyshtampovka with glossy plastic inside. In recent years, Dell has refused numerous indicators. The model Inspiron 5748 only two of them. The main showing the operation, system load and charging the battery, is located at the front end on the right. It shines white in all cases, except for low battery indication – then it becomes a yellow-orange color. The second indicator is mounted in the tray, built-in DVD-drive. 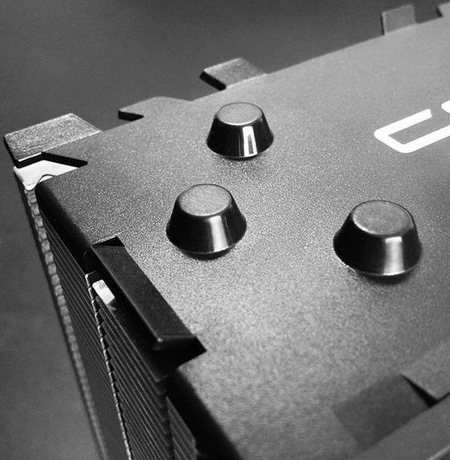 On the left side of the device are a big part of the connector and the grille of the cooling system. More precisely, in the case made big holes, for which it is seen that the lattice. Probably, from the point of view of such a large cooling air intake helps to improve performance, but in terms of aesthetics and the possibility of falling into these holes debris and dust just is not that good. Next to her rear end housed the power connector (standard for “large” Dell laptops and Alienware), and Kensington Lock. Closer to the user terminals are HDMI 1.4a, Ethernet 10/100, two USB-ports (one 3.0, it can be identified by the blue parts) and 3.5mm audio. Most of the right end of the drive takes drawer DVD. Button are standard on it in the middle. In addition, there is enough space for one more USB connector and a card reader. With regard to connecting peripherals notebook looks frankly weak. USB ports is small, and only one of them is the third generation. Slightly better situation with the card reader – it only reads the memory card standard SD (HC and XC) and not very easy to use. 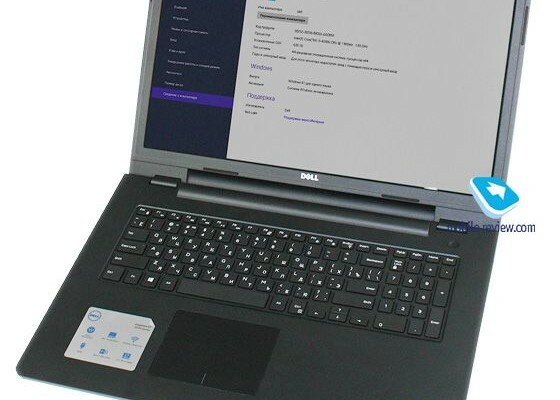 In addition to the physical connectors, and is equipped with a laptop wireless card connections Dell Wireless-N 170x (1×1), which includes, in addition to the network adapter Wi-Fi N-standard and Bluetooth 4.0 module and provides support display Wi-Fi Alliance. The sensitivity of the Wi-Fi module average, the signal received via the router 1-2 rooms without any problems. Total model Inspiron 5748 has four options screen. Resolution can be HD + (1600 x 900 pixels) and Full HD (1920 x 1080 pixels). At any resolution screen can be fitted with a touch panel, a non-touch versions are coated Truelife, which theoretically should give brightness and color vividness. In the case of HD + screen version of it helps a little. Frankly, the screen with a resolution of 1600×900 pixels at a diagonal of 17.3 inches is weak. Aggravates the situation very small viewing angles and color reproduction disgusting. At default settings, white yellow and gray-blue range disappears and is distorted at the slightest deviation from the direct view of the screen. Covering TrueLife, as has been said, helps a little, and if the color is still possible to configure let’s not perfect, but for themselves, the small viewing angles remain in any case. In general, the screen in the model, which has been in testing – frankly weakest point. Laptop got a sound card with support for high-definition technology Wave MaxxAudio. These big words hidden ordinary sound, which can be found in laptops average, when headphones are no fundamental differences from most of these devices, you will not find. When listening to music in mp3-format (320 kbit / s) with no difference losless format I could not hear. Powerful built-in speakers, their volume is enough in most situations, but in deriving the volume of more than 80% of the peak there is a lot of spurious noise from the depths of the body. Although the dynamics of making strange noises except that at 100% power and when listening to grind bark or something with a very rich bass. When playing sound or video games is no problem. Laptop got HD-camera with a resolution of 1 megapixel, the same for the entire 5000 series. Maximum video resolution – 720p. There is an LED that provides visibility of your face in a dark area. Adjust the brightness, he has not. To your partner better than you’ve heard installed stereo microphones. Not to say that it radically improved voice quality, but overall, very good. When talking on Skype your interlocutors will be good to see you and hear. In test model was a configuration close to the minimum. Processor Intel Core i3 4030U with two cores working with a clock speed of 1.9 GHz and a cache 3 MB. Him company Nvidia GeForce 820M graphics card with 2GB of internal memory and 4GB of DDR3 RAM 1600 MHz DDR3L. 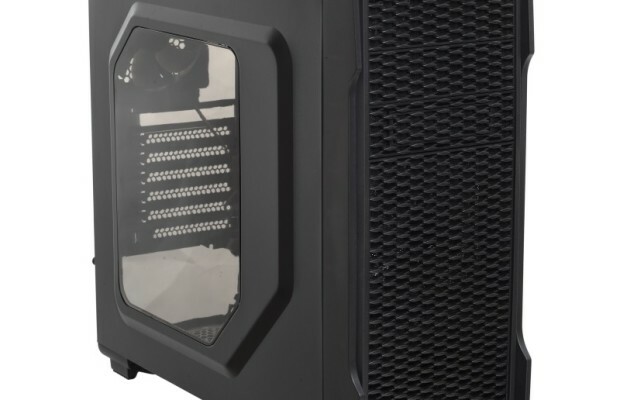 As stated in the beginning, the maximum possible for the model – 8 GB of RAM, since only one slot, and dies a larger capacity is not supported on the motherboard. The use of low-voltage processor and memory can be explained only with the unification of more portable fellow series. This configuration provides sufficient performance for home computer users that if once and wants to play, it will not try to run the game last or penultimate generation at maximum settings. However, for something more model developers never intended to use it. On the test sample was a hard drive of 500 GB. There are versions with twice the capacity, but the speed will be 5400 rev / min. The disk is not a bottleneck of the system – its performance exactly match the capabilities of RAM. It is worth noting that this version with i3 and GeForce 820M is the most balanced on the general parameters as limitation of RAM will not allow 100% more productive to realize the possibilities of processors and graphics cards, though the configuration is available to them. A set of standard software – operating system Windows 8.1 with small modifications from Dell (corporate backup and 20 GB of disk space in the cloud). The noise from the work can be quite loud, but within the expected. Since a major part of the tasks notebook copes without connecting the fan or its minimum speed that provides an acceptable level of background noise when you view, such as video. Surfing the Internet and does occur with minimal noise. Negative impression leaves only noise of the DVD-RW drive. Heating is quite noticeable – exhaust air significantly cauterize his hand, and the place where there is a laptop, also heated. 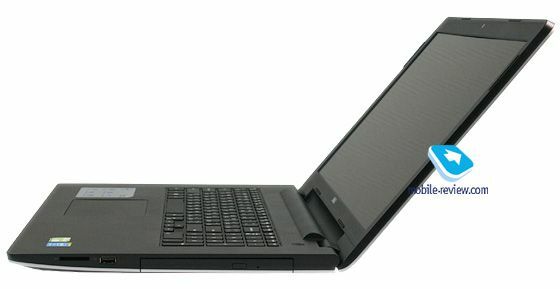 Definitely, the model Inspiron 5748 – no manual laptop. However, hardly anyone really can be considered as such 17-inch unit. On the review had a laptop with a battery of minimum capacity. Battery with parameters 40Vtch, 14.8, 2.62 Ah for such a large laptop does not look great. Those who need some kind of autonomy, we can safely recommend to look for a model with only 60Vtch battery option. Otherwise, even with minimum load (editing office documents, 3-4 tabs in the browser, connect to the network via Wi-Fi, 50% brightness) the battery life will be about 2.5 hours. When viewing Full HD video while working and may be less than two hours. Over three hours of actual use of the laptop I was not able to achieve at a screen brightness level sufficient for comfortable work. 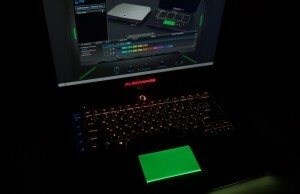 Not sure what the little battery life can be attributed to the shortcomings of the laptop. Especially because in the current generation Inspiron, Dell refused to use massive power supplies, so grab it if necessary not be a problem. Full charge time is about one hour. In general, if you look at the amount of configuration and properties, the Dell Inspiron 5748 – a budget desktop PC replacement option for those who do not need anything more than web browsing and watching videos. If you select a configuration with a discrete graphics card and maximum CPU can say that it can run any game with minimal settings. The minimum cost model based on the processor Intel Pentium 3558U is currently 22-23 thousand rubles. Such as it was in the review, should have about 30 thousand rubles, and the most productive – more than 40 thousand. This is a typical alignment of prices for low-cost laptops with 17-inch screen. The model is not without its drawbacks of most budget notebooks, and may be attractive to fans of the brand or those who prefer to have a long-term warranty from the manufacturer.